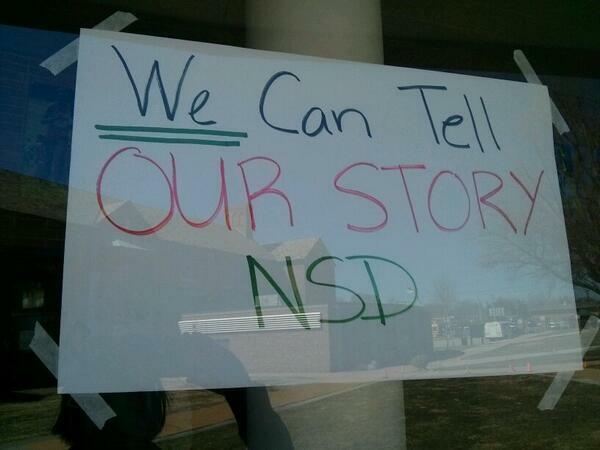 On July 1st, the unaccredited Normandy School District in north-mid St. Louis County was officially dissolved and replaced with state-monitored Normandy Schools Collaborative. Living in the district for 8 years, I've developed a great heart for the students here, and with my son beginning preschool at the Early Childhood Center, I have much vested interest in the district's success. Beyond the actual city of Normandy, MO, Normandy School District is composed of TWENTY-THREE other small municipalities. The fragmentation of St. Louis County governance causes many problems, but the one Beyond Housing is hoping to address with the 24:1 initiative is the absence of a larger sense of community. Sure, I appreciate that Bel-Nor police specifically serve my neighborhood, but that attitude is caustic to the larger school district. You've seen those situations in which when everyone is charge, no one is in charge. Without a concentrated effort to rally all of these communities to back the schools, each little hamlet will continue to flounder. The local media has done a decent job of also trying to put out "feel-good" stories on Normandy and its students (liberal guilt? ), but one of the powers of social media is the ability to craft your own narrative. If you look through these tweets from the past several months, you'll see a few you wish you could edit out, but I think its also been a great organizational tool online. You know how the best laid plans, go, but my understanding is that Normandy Schools Collaborative will proceed with implementing this plan. 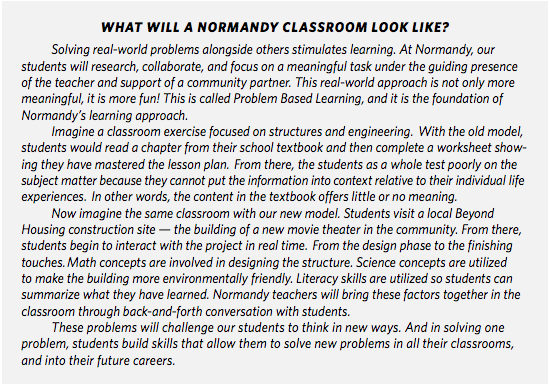 It may be filled with the best sounding edu-speak, but it crafts vision for what a classroom will look like, and refreshes the vision for what a Normandy graduate will look like and be about. Problem-based learning, passion, and students' personal interests come up often in the plan, which is tough to implement if you've been teaching "traditionally," or cannot build relationships with students, but with FOUR WEEKS of professional development on the schedule, there might be time for a good start. "upgrades to district technology infrastructure and implementation of a 1:1 Technology Initiative"
Throwing money at a 1:1 initiative is going to do nothing without proper training, accountability, and leadership, but diving into that is exactly the kind of risk I believe poor districts must take in trying to "keep up" with their affluent peers." My hope is that the state financial oversight ensures this money is not magically gone in a couple of years. In *the* textbook for diffusion of innovations, Everett M. Rodgers of the University of Mexico discusses at length the size and rigidity of an organization has a drastic impact on its ability to absorb and implement innovation. I have a personal belief that 1-high-school school systems are often better at serving their community because of this. They have more capacity to adapt to the needs of their stakeholders. I know there are things we would often like to offer to our students that we cannot because there is a (probably necessary) mandate that the offerings across our 3 high schools be as consistent and equitable as possible.